Original 1964 picture sleeve with record. 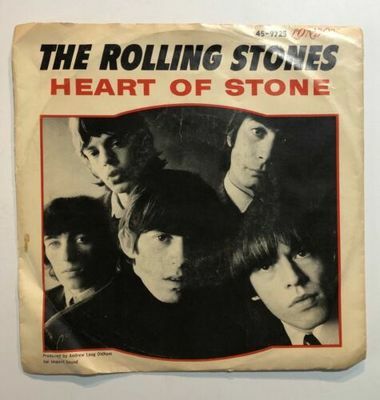 Heart Of Stone / What A Shame on London (45 LON 9725). The sleeve grades G+. There are a few small tears and some creasing along the corners. Sticker stain on one side. Another side has come unglued about 3/4 of the length of the sleeve. Could be repaired. Record has some paper scuffs and a little dust. Still has luster!! Grades VG+. Mint: A perfect record. no flaws whatsoever. Mint is perfect! Near Mint (NM): Almost perfect record. Vinyl will have only 1 or 2 minor scuffs, and will still contain all of its luster. Covers will only have very minor wear. Such as maybe a small ding on a corner. Almost perfect. Excellent (EX): Vinyl will have maybe 2 or 3 small scuffs. You will not hear the scuffs when playing the record. No scratches. Cover will have some impressions, but no ring wear evident. Will not have any writing on it. Some minor wear on corners may also be evident, but very minor. Very Good Plus (VG+): Vinyl VG+ will show wear, surface scuffs, and minor scratches. Vinyl will still have luster. You will not hear scratches while playing record. Covers may have small writing on it. But no big marks. Artwork will look great, but will show age. Seams may have wear, but no holes. Very Good (VG): Vinyl will be well played. May be faded, but looks like it has been handled carefully. Surface Scuffs and scratches will be heard, but will not over power music. Covers will be worn and maybe some seam splitting. Ring wear will be evident. May be some writing on cover. Yellowing on white parts of cover. Buyer to pay for all shipping cost. International shipping will vary. If you are an international bidder, I will only accept paypal as a form of payment. I will combine shipping if you bid, and win multiple items. Please contact me if you plan on bidding on multiple items! If you purchase multiple items, please wait for an invoice with combined shipping!! Shipping inside the USA is Priority mail shipping as my first option, and either parcel post, first class, or media mail shipping as a second option depending on the item. If you feel shipping is too high, please look at the second shipping option. I always include a second shipping option for all items!! As far as international shipping, first class is my main option and Priority Mail as a second option. If you have any questions please feel free to ask. Thanks for looking and good luck!! All clothing comes from a smoke free home! All LP's will be shipped inside of a poly sleeve, with record outside of the sleeve. Records will either be shipped with paper inner sleeve, or company sleeve. They will be shipped inside of a cardboard record mailer. 78's will be shipped inside of a 12 x 12 x 6 box in between cardboard.